What is Blueberry Beauty Collagen? 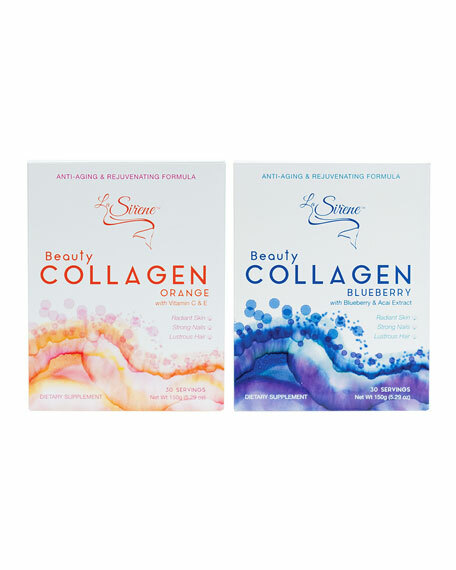 Our Beauty Collagen Flavor Duo is the perfect choice for those who want to take advantage of the powerful benefits that our blueberry and orange formulations have to offer  or simply want to switch flavors at their convenience. A dietary supplement double-packed with natural antioxidants  Blueberry, Acai Extract & Coenzyme Q10  that work from deep within the cells to nourish and rejuvenate the skin, hair, and nails while boosting energy levels, normalizing sleep, improving mental functions and heart health. It's an easily ingestible powder that's perfectly measured at 5 grams and conveniently packaged for on-the-go use. La Sirène's Blueberry Beauty Marine Collagen is produced in Japan and derived from the scales of wild fish. A dietary supplement enriched with natural antioxidants  Vitamin C & E, along with Coenzyme Q10  that work from deep within the cells to nourish and rejuvenate the skin, hair, and nails while detoxifying the body and boosting the immune system. It's an easily ingestible powder that's perfectly measured at 5 grams and conveniently packaged for on-the-go use. La Sirène's Orange Beauty Marine Collagen is produced in Japan and derived from the scales of wild fish. If you are pregnant or have any medical condition, please consult with your doctor before consuming. Dissolve 1 sachet into 6-12 oz. of water, juice, tea or a smoothie. For optimal results, consume 2 sachets daily. Pure, Potent and Natural Ingredients.